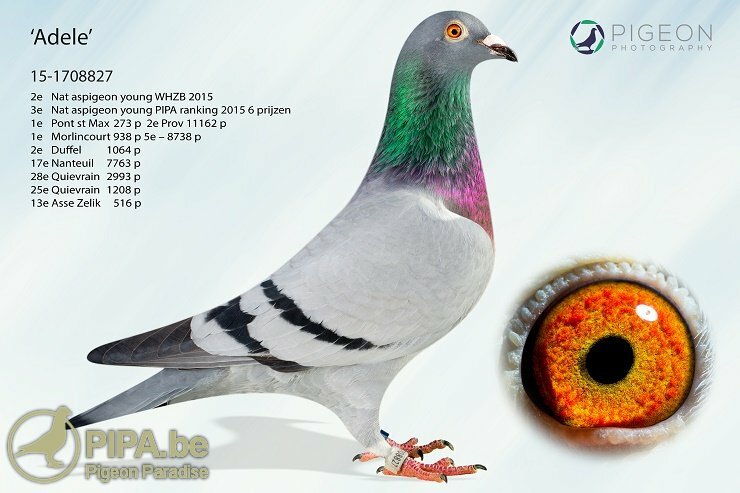 Peter van de Merwe claimed a 1st, 3rd and 11th place in the PIPA ranking for Best Ace Pigeon Young Birds in The Netherlands (6 prizes). 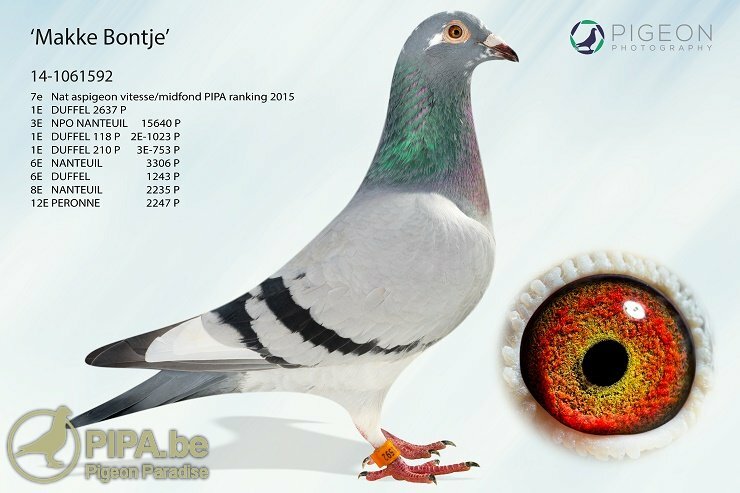 In addition, his daughter Gwen took a 7th place in the category of Best Sprint-Middle Distance Pigeon in The Netherlands (10 prizes). Nanteuil NPO   15,640 p.: 1-3-4-etc. This overview shows that they won two victories in the NPO and a national first prize with their yearlings. We introduce you to the winners of a 1st NPO Nanteuil, a 1st National Chateauroux and a 1st NPO Ruffec. Rivaldo won a first prize from Nanteuil against 15,640 pigeons. The sire of Rivaldo is United, 2nd National Ace Pigeon Young Birds TBOTB in 2009. The dam of Rivaldo is Natalie, a daughter of super class breeder Replay. Click here for the full pedigree of Rivaldo. 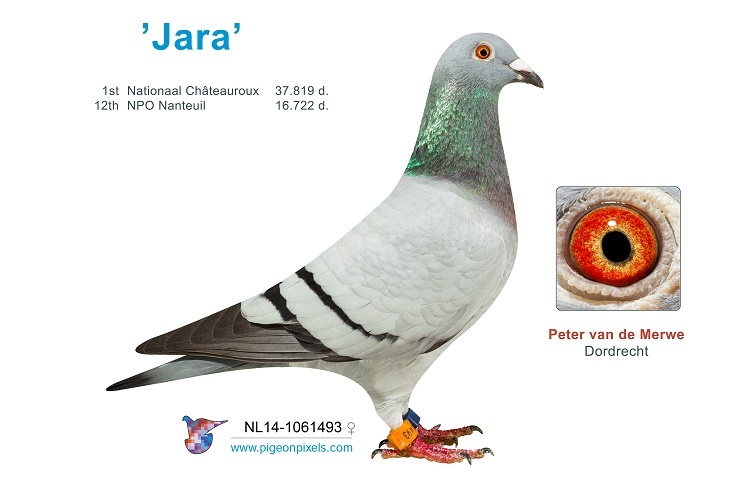 Jara claimed a national first prize from Chateauroux against 37,819 pigeons. This hen had already shown her potential earlier on with a 12th NPO Nanteuil against 16,722 pigeons. Click here for the pedigree of Jara. 1st NPO Ruffec       4,133 p.
8th Prov. 5 Peronne 19,772 p.
11th NPO Nanteuil    16,722 p.
The sire of Alivierro is Big John Jr. and he comes from Guy van der Auwera (Gooreind/Wuustwezel, BE). The dam of Alivierro is Fenna, and she is another daughter of Replay. You can find the full pedigree of Alivierro here. Gwen won an additional six top three prizes in the national young birds' championships. As you can see, this racing team won a 1st, 3rd and 11th prize in the category ace pigeon young birds and a 7th prize in the category old birds sprint/middle distance PIPA rankings. 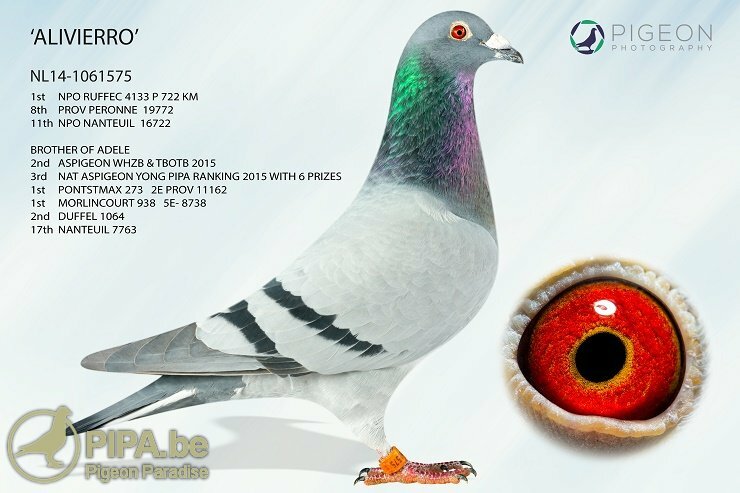 We will take a closer look at the pigeons that won these championship prizes. 2nd Duffel           79 km  2,355 p.
1st Duffel           79 km  1,064 p.
13th Pt.-St.-Maxence 316 km 11,162 p.
25th Nanteuil-le-H.  326 km 14,183 p.
18th Troyes          393 km  7,553 p.
12th Asse-Zellik      106 km 1,306 p.
Both the sire and dam of Jill come from the loft of Guy van der Auwera (Gooreind/Wuustwezel, BE). Click here for the full pedigree of Jill. 2nd Pt.-St.-Maxence 316 km 11,162 p.
10th Morlincourt     275 km 15,984 p.
24th Nanteuil-le-H.  326 km 14,183 p.
2nd Duffel           79 km  1,064 p.
28th Quievrain       170 km  2,993 p.
25th Quievrain       170 km  1,208 p.
This pigeon won a second prize in the national WT competition as well. 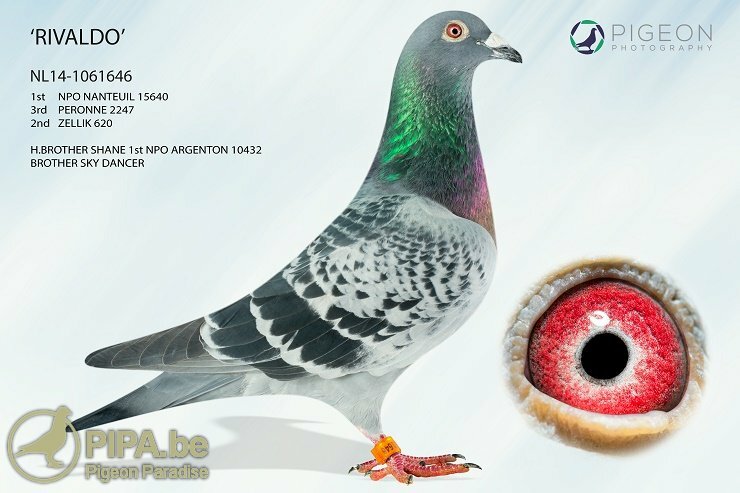 The sire of Adele is another pigeon of Guy van der Auwera. The dam of Adele is a daughter of the renowned breeder Replay, which has already bred numerous big champions. Click here for the pedigree of Adele. 19th Moeskroen       154 km 22,012 p.
3rd Quievrain       170 km  1,208 p.
49th Troyes          393 km  7,553 p.
3rd St.-Quentin     239 km    439 p.
143rd Morlincourt     275 km 15,984 p.
322nd Pt.-St.-Maxence 316 km 11,162 p.
3rd Nanteuil-le-H. 326 km 6,295 p.
6th Nanteuil-le-H. 326 km 3,306 p.
2nd Duffel          79 km 1,023 p.
3rd Duffel          79 km   753 p.
6th Duffel          79 km 1,243 p.
12th Peronne        243 km 2,247 p.
22nd Quievrain      170 km 1,208 p.
115th Quievrain      170 km 4,117 p.
The sire of Makke Bontje is a 100% Leo Heremans pigeon of the Van Toor brothers (Vlaardingen, NL). The dam is Flora, and she comes from Son Cocktail x Louise. Click here for the full pedigree of Makke Bontje. After selling their collection of breeding and (old) racing birds Peter and Gwen made a fresh start in 2015, and they quickly managed to start winning prizes again. 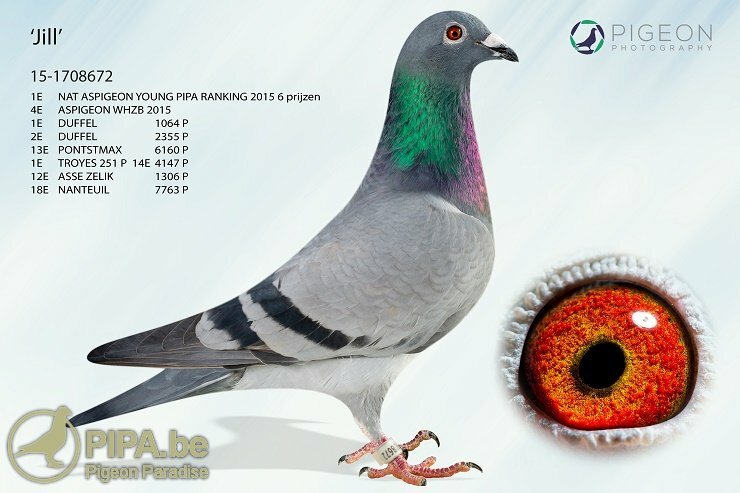 Numerous top results and national championship titles, including that of 1st Best Ace Pigeon Young Birds in the PIPA rankings, have shown that this is a pigeon collection with great potential. These pigeons are quite likely to play an important role in The Netherlands in the seasons to come.